Make the Right Choice as a Christian. What would you Choose? Trust in God or in human strength? A little over two thousand years ago, a baby boy was born in a small, rural hamlet called Bethlehem. He spent most of his life in the even more obscure village of Nazareth and barely ever left the tiny nation of Israel. He didn’t lead any armies or write any books. Also he wasn’t a great world leader or a powerful general. He was a simple rabbi who trained twelve men and was executed by the Roman government before he turned 35. And yet, after his death, Jesus Christ went on to become the most consequential and important person in all of history. In fact, his life is so important that the entire world orders its calendar by it. There has never been a man – nor will there ever be one – quite like Jesus Christ. But who was he, really? What is his life history, life facts? This is a question that has haunted countless people since his death. In fact, it was a question that people asked while he was still alive. The Gospels are littered with people asking “Who is Jesus?” and others giving their opinions. When he asked his own disciples who he was, they responded, “John the Baptist. Others say, Elijah; and others, one of the prophets” (Mark 8:27). But Jesus was more than a prophet. He was more than a teacher or even a king. In ancient times, a person’s name and titles revealed a great deal about him. For example, the name Jacob, a name that can mean something like ‘deceiver’, was given to a young man in the Old Testament who turned out to embody his name quite literally. With this in mind, if we want to discover who Jesus Christ was, a great place to start would be with his name. The young virgin, Mary, was visited by an angel and told that God himself would conceive a child in her womb. Around the same time, her fiance, Joseph, received a similar vision and was told, “[Mary] will bear a son, and you shall call his name Jesus, for he will save his people from their sins” (Matthew 1:21). The name Jesus is an ancient name. In Hebrew, it’s pronounced Yeshua and it’s the exact same name that Moses’ successor, Joshua, had. Before we go any further, it’s important to recognize that these events and people – Joseph and Mary, the nativity at Bethlehem, Jesus’ life and ministry – all of these things are historical realities. These things actually happened. There was, in time and space, a virgin named Mary and a young man who was engaged to her named Joseph. And this couple gave their son a name that has deep roots in someone else from history, Joshua the son of Nun. And the Bible isn’t the only witness to Jesus’ historical reality. The ancient historians Josephus and Tacitus both mentioned Jesus by name. The Gospels are not myth. There’s very little doubt from modern scholars about Jesus’ existence. It is a historical fact that a man named Jesus lived and died in the first century. He taught and preached about the Kingdom of God. And he worked wonders. Finally, he was executed by the Romans under the authority of the governor of Judea, Pontius Pilate. But is that all? Jesus came into the world as a savior. But if that’s the case, what kind of savior was he supposed to be? We can learn more about the answer to this question by reflecting on his primary title: Christ. 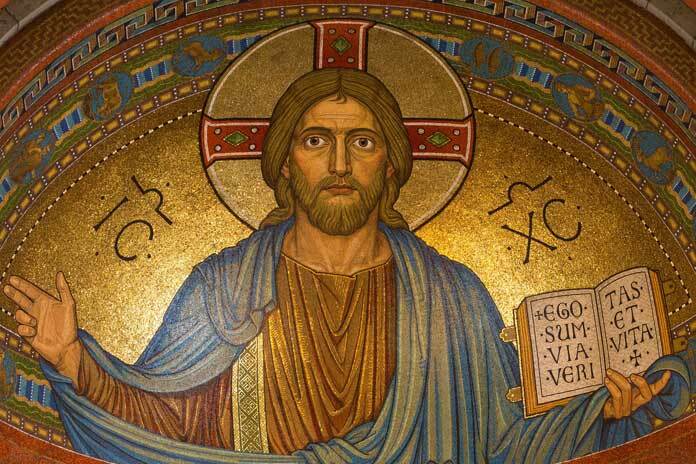 Contrary to popular belief, ‘Christ’ was not Jesus’ last name. It’s a title. In fact, it’s the most used title for Jesus in the entire New Testament. It’s used over five hundred times throughout the Gospels, Acts, Epistles, and Revelation.But what does it mean? The word ‘Christ’ comes from the Greek ‘Christos’ which literally means ‘anointed.’ It’s equivalent to the Hebrew word ‘Messiah.’ So, to put it simply: ‘Christ’ is the English version of ‘Christos’ which is the Greek version of ‘Messiah’ which is Hebrew for ‘Anointed.’ In the Old Testament, there were a number of people who were literally anointed with oil. A prophet would come to the person and douse them with oil so that it covered their head and ran down their bodies. This is pictured by the Psalmist in Psalm 133 where we read, “Behold, how good and pleasant it is when brothers dwell in unity! It is like the precious oil on the head, running down on the beard, on the beard of Aaron, running down on the collar of his robes!” (Psalm 133:1-2). Priests were often anointed when they were ordained but the more common use for the term Christ or Messiah was when it referred to God’s chosen king. Saul, Israel’s first king, was anointed by the prophet Samuel and so was David. God chose them to rule over his nation. And though they had successes, they also had many failures. Even David was so caught up in lust that he was willing to commit adultery and murder – perverting the very justice he was supposed to be upholding. And so, Israel longed for a truly just and righteous king. But every king who came failed. Why? Because they were human. And humans are prone to failure. Nevertheless, throughout this time, the Prophets spoke about one who was coming who would be a perfect king. Daniel saw a vision of this perfect king and described him as “one like a son of man, and he came to the Ancient of Days and was presented before him. And to him was given dominion and glory and a kingdom, that all peoples, nations, and languages should serve him; his dominion is an everlasting dominion, which shall not pass away, and his kingdom one that shall not be destroyed” (Daniel 7:13-14). Elsewhere he’s described as bringing peace, wisdom, righteousness, and salvation – among other things (See Isaiah 11:1-16). Saul, David, and Solomon might have been anointed, but they weren’t the anointed one. The anointed one would become king, not just of Israel, but of all creation. He would be the King of kings. And as is evident by Daniel’s vision, he would be “one like a son of man” and yet, so much more. That’s how he was able to become the world’s perfect king. He was more than a man. Jesus Christ was God in the flesh. HE WAS MORE THAN A MAN. JESUS CHRIST WAS GOD IN THE FLESH. Jesus was not merely a teacher or rabbi. He was the true king of the world. And he proved that he reigns over all things – visible and invisible – when he showed his authority over the one thing that no man has conquered: death. When Jesus broke out of the grave and ascended to the right hand of the father, he made it clear exactly who he is: God and man, teacher of righteousness and king of the cosmos, Jesus, the Christ. The only question that we’re left with is this: How will we respond to his offer of salvation? We are here to grow with You! We do not just want to be “Sunday Christians”, but those who enjoy the love of God every minute of the day, whether at work, or rest, or prayer.